A wearable RIID designed for first responders, armed forces, border security and other CBRN experts. More powerful than a RIID, a pocket-sized device that can recognise isotopes and neutrons in seconds. 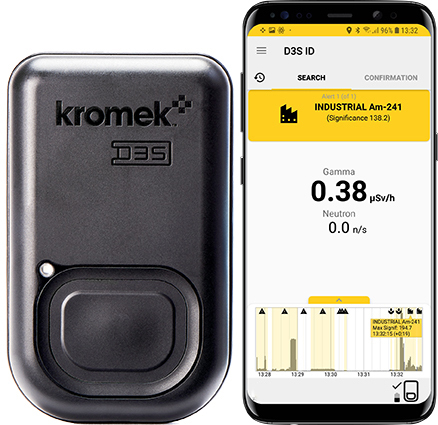 The D3S ID wearable RIID gamma neutron detector identifies radioisotopes and detects neutrons in seconds but unlike a conventional RIID, it is small and light enough to be wearable and concealable. All a suspect will see is someone looking at their mobile phone or listening to an earbud. Designed to detect radiological threats like dirty bombs, radioactive contamination, smuggling of radioactive substances and radiation at the scene of an accident or terrorist attack. The D3S ID wearable RIID gamma neutron detector turns anyone into a radiation warning system that is hard to avoid and can go anywhere a terrorist or smuggler can. 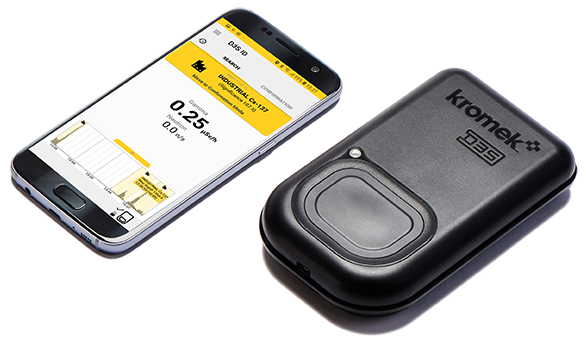 No need to point the detector at a threat because the D3S ID scans in the background, it identifies isotopes in SECONDS and informs the user via a mobile phone app – no need for the public or a target to know what you are doing. It can even be joined to the DARPA Sigma network to share radiation alerts with a centralised control room. You never know where your mission will take you and what you will face so we designed the D3S ID to operate in both high dose and low dose radiation environments. 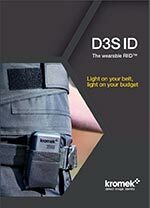 What is the D3S ID wearable RIID? It is a wearable, concealable gamma neutron RIID which puts the power of a RIID into a package the size of a PRD. It is the new standard in portable radiation detectors. Wearable, unobtrusive and hands-free it is continuously scanning for radiation: gamma-ray and neutron (so it can detect shielded devices). No one can see it in operation, or that you have found anything suspicious. You can go anywhere a terrorist could have gone and search areas quickly and efficiently. Unlike static or vehicle-mounted detectors, a person carrying a hidden detector is tough to avoid and detect; literally, anyone could be carrying a D3S ID. The D3S ID wearable RIID is designed to be used by almost anyone. Turn the detector on, launch the phone app, and in seconds you are good to go. Armed with the D3S ID, you are a walking gamma and neutron detector, able to detect even shielded sources and identify the isotopes used. The D3S ID is hands-free, you can go about your duty as usual with the phone announcing any radiation found into your earbud or by vibrating – alerting you to take further action. It takes less than a minute to deploy: take it out of the box, switch it on, put the sensor on your belt, the phone in your pocket, and you are good to go. Using the D3S, you can quickly and easily equip anyone to become a radiation detector giving you fast coverage for a location. One of the fastest and most accurate isotope ID devices on the market. Works in high dose environments. English and Japanese versions available. Specifically designed for use by anyone, specialists and nonspecialists alike, with minimal training required. The D3S can be used by staff across a wide variety of sectors, including customs and border patrols, police, first-responders, at airports, event security and environmental monitoring. Identifies 22 more isotopes than RIID standard: ANSI N42.34. Four times faster than RIID standard. A fraction of the size and a fraction of the cost of other RIIDs. Small and concealable to covert monitoring of suspects or location. Gamma detector volume: 1 in3 (16 cm3). Gamma energy range: 30 keV to 3 MeV. Gamma sensitivity for Cs137 5 cps/μR/h (500 cps/μSv/h) Photo peak 1.2 cps/μR/h (120 cps/μSv/h). Maximum throughput for gamma channel: 10,000 cps. Dose rate: 2.0 mR/h (20 μSv/h) at 662 keV. Neutron detector: 9 cps in a 1 neutron per cm2 field. Neutron detector gamma rejection: Better than 10-7, meets ANSI N42.34 section 6.7. Maximum throughput for neutron channel: 5,000 cp. Operational battery life: 12 hours. Operational temperature range: −20°C to 50°C, meets ANSI N42.32 section 7.1, section 7.2, section 7.5. Device size (excluding phone): 5.2″ x 3.1″ x 0.9″ (132mm x 80mm x 23.5mm). Device volume (excluding phone): 248 cm3. Humidity: Up to 93% RH ANSI N42.32 section 7.3. Moisture/dust protection: IP53 as per ANSI N42.32 section 7.4. Now available with Japanese speech and text translation. The D3S NET is the SIGMA Network linked version of the D3S. It is the only networked hand-held allowed on the SIGMA Network. All the power of the D3S now networked with static radiation detectors and in-vehicle gamma and neutron units. Find out more about the D3S NET.